Review: Here Comes Cat Stevens! 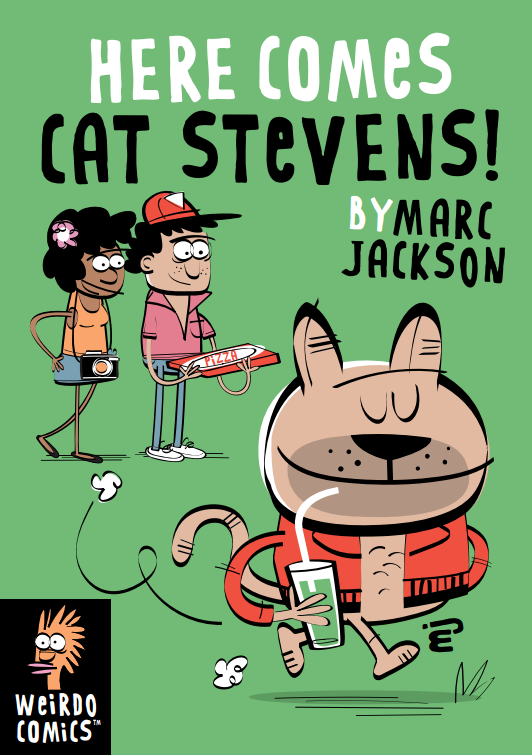 I’ve written a lot about much I enjoy Marc Jackson’s comics. He has this wonderful combination of absolute deadpan reality and gleeful silliness that hits me right where I laugh. His newest, Here Comes Cat Stevens!, is no exception. WHO HAS A NEW JOB DELIVERING PIZZA! What follows is what The Mighty Boosh team would do with Scooby Doo, just with better jokes. Cat, Rita and Joel head out to the woods, they deliver the pizza…sort of…hi jinks ensue and the comic wraps up leaving you with a smile on your face. It’s great stuff as ever and it was commissioned by the Lakes International Comic Art festival and funded by a grant from Arts Council England. It’s wonderful to see work like this getting supported, especially as it’s going to make it’s debut at MACC-POW!, the one day comic festival Marc organizes in Macclesfield on 1st July. After that it’ll be launched on a larger scale later in the year as part of LICAF’s weekend celebration of comic art. You can find more details of Here Comes Cat Stevens! as well as Marc’s other stuff at his site. Go say hi, he’s great.